Farm to Table defines the entire supply chain for the food industry. It consists of many different levels of sophistication and systemization. As shown in the graphic below, a Blockchain and IoT solution provides the capability to understand and document via one single source of immutable truth the entire chain of custody of a food product and its complete provenance. Group50, subject matter experts in productivity, cost takeout, supply chain and supporting technologies, has developed an integrated Blockchain and IoT plug and play solution called Scioebc™ . We have also created a 7-step implementation process that includes 4 workshops which are focused on guiding senior leadership through the planning and integration of these transformational technologies. 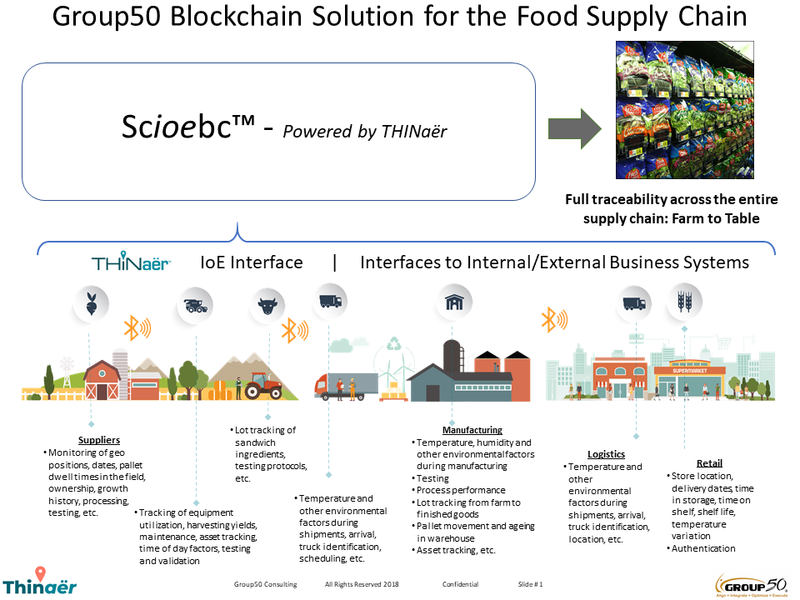 To find out more about how you can apply Blockchain and IoT to the Food Industry, call Group50 at (909) 949-9083, drop us a line at Blockchain@group50.com or request more information here.